At the start of our business, we were growing so rapidly that I was under the belief that I didn’t have to sell. As a result, we didn’t. Our primary means of gaining customers was through referrals, we fed off of recurring work from one or two customers, and we also thrived on a health friends and family network. This process worked for the first several years. In order to learn the basics of how to sell, I had to just jump right in and do it. We found a weekly published permit list, and from that list we contacted individuals that looked like they could be a good fit for us. Back then, we primarily focused on re-modelers. That was because we did a lot of pre-finished cabinetry for some commercial guys we knew from our college days, and we would contact them. That was the beginning of our sales ‘method’ per se, but it really wasn’t much of a method. Moving forward, what I’ve learned in recent years is how to make a better sales process. Running Out Of Ideas For Closing More Sales? I’ve found that everything in business can be refined into a process and our company is a great example of that. If you take a look at all of our old blog posts, we really delved deep into lean thinking and standard processes and procedures. This translates well over to sales processes as well, which can be turned into a standard operating procedure. Recently, we’ve made the transition from a referrals based company to a sales based company. What this has taught me is that sales don’t happen by accident, whereas sometimes referrals do. A referral may result in a sale, but the frequency is not something you can control. This can be a problem, because most businesses rely on referrals to further their customer base. One month, referrals could be streaming in at a rapid rate, but the next there could be nothing. To reiterate: Sales is something that we can make into a process because the actions leading up to it we can control. A referral is something that we want, but can not control. This can come from almost anywhere, but it will depend on the type of business that you do. For example: if you’re a residential contractor, maybe there is an HVA, or several, around you which you could contact. Perhaps there’s a weekly permit list that someone is posting which you can buy for cheap. There might be a contractor list of all the people who have pulled permits. 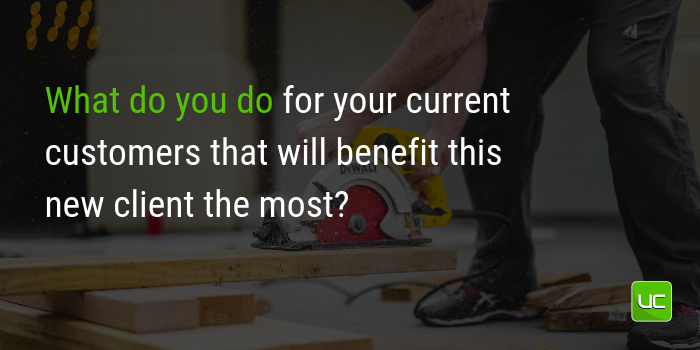 Millwork shops and online areas can help you buy bid news and lead generators. Another way to generate leads is to drive around and find a hot residential or building area. You can usually find a large portion of contractors or their signs in the areas. Afterwards, you can call them up and introduce yourself and your company, and ask if you can be placed on their bid list. This may be one of the most important ways that you will be able to build your lead base and sales process. Once you find the leads, you’re going to need a way to store them. Whether they turn into a sale now or later, you need to have a big enough list that you can create a sales funnel which is consistently pouring new leads into the top, and converted sales out the bottom. Use a CRM to do this process. We use HubSpot which is a fantastic CRM software. It can automate and integrate as deep as you want to go. Or it can just take care of baseline customer management like storing info and keeping track of interactions with the customer. One crucial step on the CRM is that you need to update it every time you contact the customer so that you keep a running record of what you have talked about. Most CRMs will allow you to call in the app which can allow you to keep track. If not, try to make all your sales calls from the same place where you can make notes as you go. Updates must be a deliberate part of your method. It takes seven points of contact before you’re even really given a chance to put in a proposal and even have a shot at gaining someone’s business. So if you’re expecting to make cold calls and get business on the first or second call...it absolutely does not happen. And even if you do convert on the first call, you may want to ask yourself why it was so easy. There could be a red flag as to why they are so eager to switch. Again, it can take seven times for you to even get something emailed to you to get a quote. 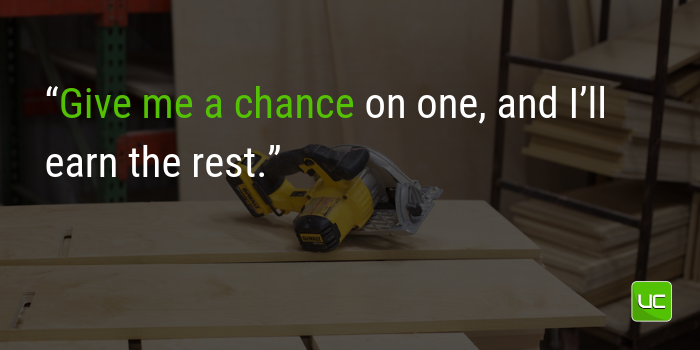 Even after the quote, it can take seven more times to have an opportunity to convert the sale. So you have to maximize your points of contact which can be: a phone call, email, text, or any other form of getting yourself in front of them. After emailing your proposal and giving them a chance to evaluate your numbers, it’s time to get your game face on. Ask the hard questions. Ask if your price is higher or if there’s a huge difference between your price and someone else’s. Now is the time to justify the difference in price, lead time, quality, and whatever else you need to reassure them on while they have your numbers in front of them. If price is the only factor, one of the go to ways of mitigating a price argument is to tell your potential customer that while you may charge a little more than the competition, it’s necessary so that you can take care of them correctly. The great thing about this line is that it reduces their perception of risk because they’re limiting their potential issues to one project, or one set of cabinets. Then after that, you can go and talk about expanding their thoughts to more projects. Once you clear that first hurdle, the rest clear themselves. Whereas so many people try to attack the closing deal with ‘we want ALL your business’ this method looks to bid one job. Once that job is complete and both sides are satisfied, let's look at what the future holds with our companies together. It’s much more reassuring for your customer, who may know little to nothing about you, to give you a shot at one job than to give you a shot at all of their jobs. You have to stay relevant to your customers, new and potential, and you have to be constantly following up with them. Sales is a process that is continual. So follow up, follow up, follow up! The best way to make sure that you're following up with all your leads is to make use of an inbound marketing campaign. Until recently, I knew nothing about the concept of inbound sales and marketing. Even now, I’m just getting a grasp on the power of inbound marketing compared to our old practice of outbound marketing. I’d like to explain to you the differences between the two and why inbound could be one of your most important tools. To start: What is outbound marketing? This is the traditional form of marketing; gritty, in your face tactics. When you picture the megaphone type of sales with billboards, advertising, commercials, mailers, etc. you’re thinking of outbound marketing. There is a method to outbound marketing where you have the ability to target a certain audience or certain group of people with your message, but essentially you’re still screaming your message out to the masses. What this ends up relying on is a game of percentages: how many people are actually going to pick up, listen to, and relate to your message? Even after all those steps, how many people will actually end up as a sale? That conversion factor lets you know if your outbound sales campaign is successful or not. If you end up falling into the low percentage rate, where your dollars spent ends up being much higher than the people you bring in, the campaign was a failure. However, this is not to say that outbound marketing does not have its own place in your market area. In fact, in the past there have been many successful outbound marketing campaigns. 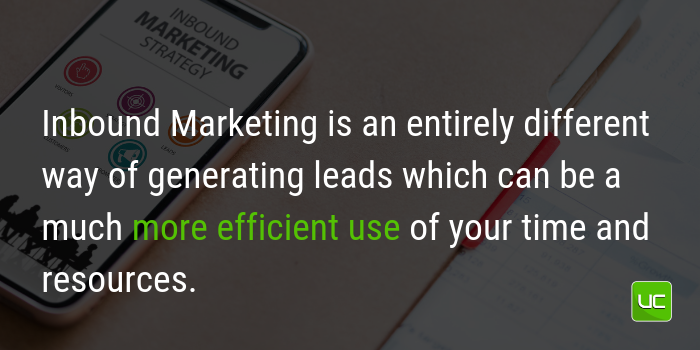 But, in comparison, Inbound Marketing is an entirely different way of generating leads which can be a much more efficient use of your time and resources. So let's jump in! 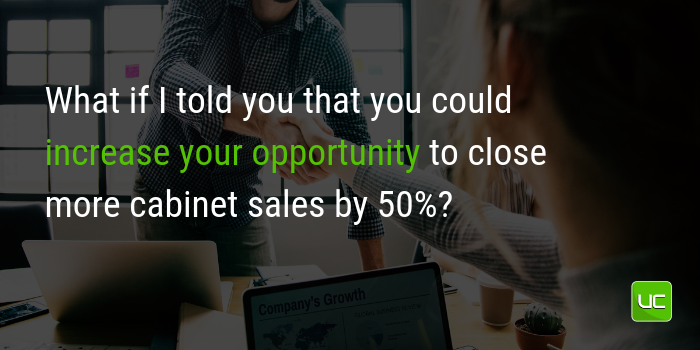 Are You Having Trouble Closing Your Sales? Inbound Marketing is almost the opposite of outbound. For example: if you look at outbound as a type of megaphone, inbound would be a magnet. What I mean by this is that you are attracting an ‘ideal customer’. If you took a piece of paper and wrote down all the qualities that you would want in a prospective customer, what does that look like? Inbound Marketing is a strategy that aims to put your voice right in front of those kinds of people, so that you can talk to them directly. This allows you to appeal to the likes and desires of a particular subset of individuals, and not just shouting to the masses. You invite the customers on a journey to learn about, experience, and ultimately buy your product. Inbound Marketing can be looked at as generally expensive. There is a much higher time requirement to utilizing inbound marketing compared to an outbound marketing campaign. For outbound, you can simply drop a postcard in the mail, or buy an ad in a magazine or newspaper and your campaign is done. 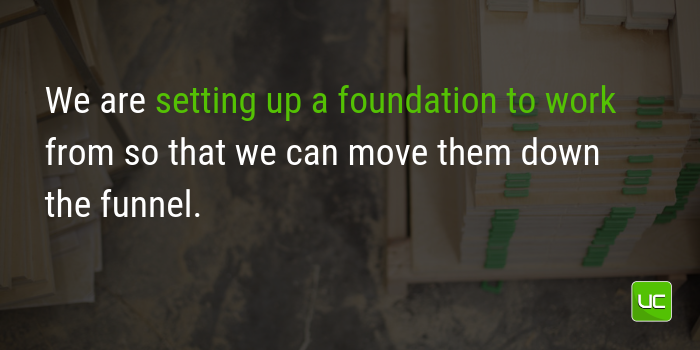 However, Inbound requires you to take a few building steps before it really takes off. You have to build a following, you have to build content, you have to build an engaging website, and all of these things can add up to a large upfront cost for inbound. But the difference is immense. 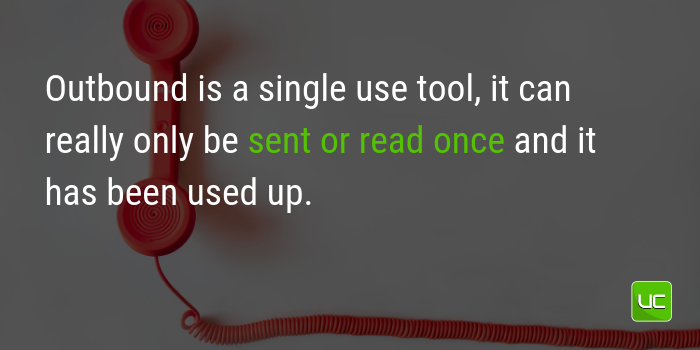 Outbound is a single use tool, it can really only be sent or read once and it has been used up. But if you create quality content to use for Inbound, it’s there forever. It never comes down and anyone browsing your website or blog can easily click on it and read through or view your take on important topics. While it takes longer to produce this foundation, when it exists, it provides much more stability to build further content from. Your company will benefit from the stability of this base and can grow their inbound strategy based on past success. I believe that when you have a strong following and base for your inbound campaigns, you can then start to look at using outbound to help amplify your growth and results. The way Ultimate Cabinet Components uses inbound can be seen through the variety of articles and content we put up. We attempt to create content that is long lasting and will be of use to our customers long after the first publish date. One of the biggest misconceptions I had in the past was that I never thought that sales could become a standardized process. I simply thought it was something that companies just did or worked on when they had spare time. But in reality, sales should be a continual process. By having a constant sales process you can streamline your methods so that you have a way to work every segment of your sales funnel. It keeps your funnel full, because you’re constantly working on all your contacts and leads at every moment in time. 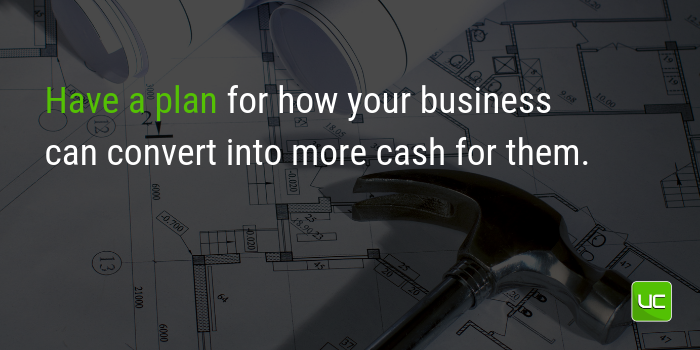 Most importantly, by making a defined plan, you are able to secure and close more sales. For instance, let's use the metaphor of mowing a yard. During the seasons when our yard is constantly growing, we cut it on a regular schedule. However, if you miss a few weeks and the weeds get tall, it can take two or three times to get it back down and even then it may not look as good as it did before. If you look at sales in the same regard, if you’re constantly staying on top of it then the process is easy and doesn’t take long. 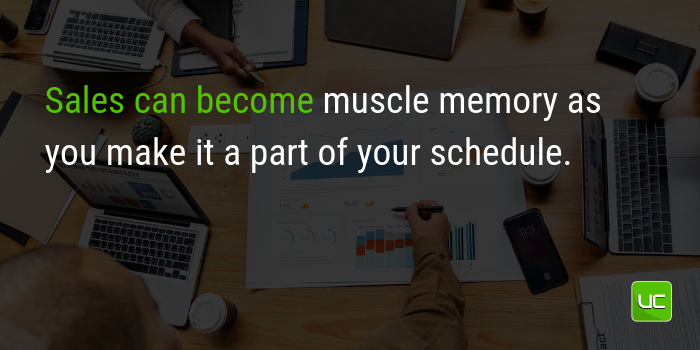 Sales can become muscle memory as you make it a part of your schedule. But, if you let that process slip it can quickly spiral out of control and your funnel will disappear. At this point it becomes an empty container of contacts which are not being followed up with and almost erases any likelihood of making the sale. Instead, you need to always be moving those contacts in the right direction by consistently following up. Be as Efficient As Possible When Closing! Basically, a sales process will define how you get those leads from the top of the funnel to the bottom of the funnel. Ultimately it is a smooth and consistent effort, which actually makes it less work in the end. Just like any other SOP we are looking to create efficiency. Contextually for the sales process this means that we are always making contacts. At first, it takes the yard a little while to green up. But once it does sprout, we just need to keep clipping it down bit by bit, every other day or so to keep it looking great. 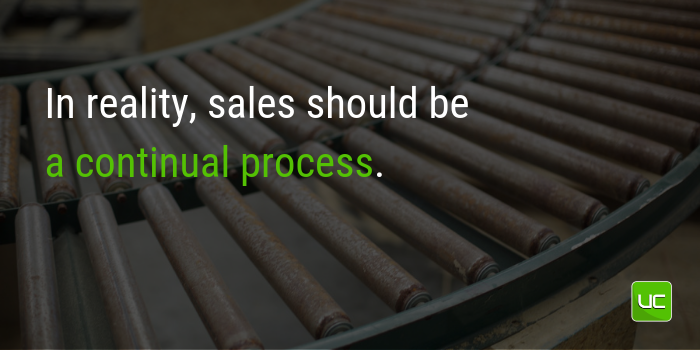 Another reason we should have a sales process is to avoid the vicious sales cycle. In the past we talked about the vicious sales cycle, you can read more about that here. In a nutshell, it says that a shop will sell for long periods of time and when they get to capacity, they will stop selling so that they can just focus on producing. But once they get done producing, they have to go sell more and as a result experience periods of drought when they don’t have customers. Instead of those two processes being mutually exclusive bell curves, you want to turn them into steady lines that increase to the right. Yes this is sometimes easier said than done. But with a sales process in place, we can ensure that we are efficiently working our leads constantly and consistently. The most important part is constantly working our clients to make sure our funnel is always topped off and dropping sales for us on the bottom end. With all that being said... Do you know how to create the best sales process possible? It all starts with standardizing your sales process. I’ve written a bit on this before but basically this relies on building a sales funnel which you pour leads into the top of, and through maintaining constant contact with them, they become sales on the bottom end. So let's try to combine all of these components and talk a bit more specifically about what we need to create the ultimate sales process. We collect leads from our website on a regular basis. Mainly this occurs through client interaction with the content we produce such as our blog posts and podcasts. Another way that we obtain leads is through a qualified list which has specific features that we are looking for in customers for our company. This gives us a consistent source of people that we put into the top of the funnel and can constantly market to. Now, this doesn’t mean that we dump a huge marketing plan onto every lead that comes into the funnel, rather we tailor our approach to each contact that we get. This allows us to aggregate leads and focus on the ones that are ready to take the next step with us. The aggregation process can be very simple. Personally, I have some filters set up in my Hubspot CRM which helps me sift through new or unqualified leads. The necessity of this step can not be overstated because you don’t want to be distributing the marketing content that you’ve worked hard on, to people that it doesn’t pertain to. From a contact, we want to produce a sales qualified lead. The process by which we achieve this is to create curated content or reach out to the specific contact to get them further down the funnel. For example: if I have a marketing qualified lead that has visited the website a few times, and downloaded a resource, that would serve as a flag. This would create a task for somebody in our organization to reach out and call them in order to learn more about their company. The next step would be converting them from a marketing qualified lead to a sales qualified lead by setting up exploratory calls to see if their company would be a fit with ours.This process will generally drive your contacts further down the funnel because it shows that not only do you care about their business, there is a mutual benefit for you to join them in business. Getting your contacts out of a sales qualified lead and turning them into a full fledged customer can oftentimes be a long process. I’ve worked with contacts for months who have hung around in the sales qualified lead phase that eventually turned into customers because it finally fit. You always have to remember that very seldom will you get a customer on the first or second try. What’s more important is the constant contact, or the rapport that you build with them which will eventually gain you a customer in the end. Look at your sales process and the contacts you currently have. Can you build a process with the current base? Try dividing them into cold leads (which would be at the top of your funnel), marketing qualified lead (someone who shows interest), and sales qualified lead (a very engaged lead who has interacted with your material), and current customers who are at the bottom of the funnel. This will allow you to know exactly how to talk to each of your leads and can direct you to the next step you need to be taking with them. 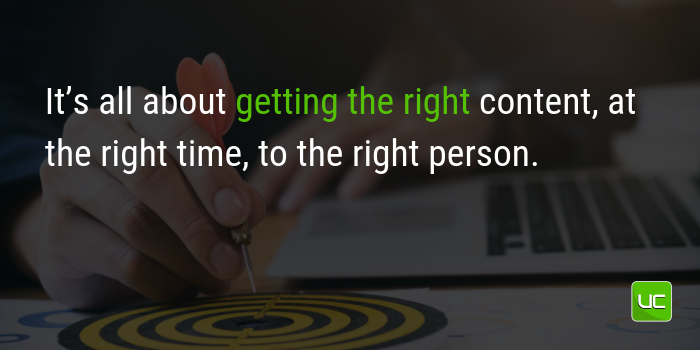 It’s all about getting the right content, at the right time, to the right person. Perhaps the most important thing about any sales process is constantly pouring leads into the top of your funnel. This is not to say that you always need a large quantity of leads pouring in. Quality is the main thing that you should be looking for in leads. We want to try and get leads that fit both our sales process and what our company is looking to do. For instance, if you work for home builders it may be good to find a weekly or monthly permit list which shows what permits have been pulled in for your area. This would serve to feed your funnel with consistent and quality leads.The next step after you get a lead into your funnel is what you do with it! First and foremost you have to connect with that lead. This is probably the part where the majority of sales people fail to make closes and it’s a result of them not maintaining consistent connections with their leads.Leads do your business no good, if you can’t drive them farther down the funnel and eventually convert them into customers. Every single time there is a new lead, I always try and give them a phone call. If they don’t answer, I always leave a voicemail. 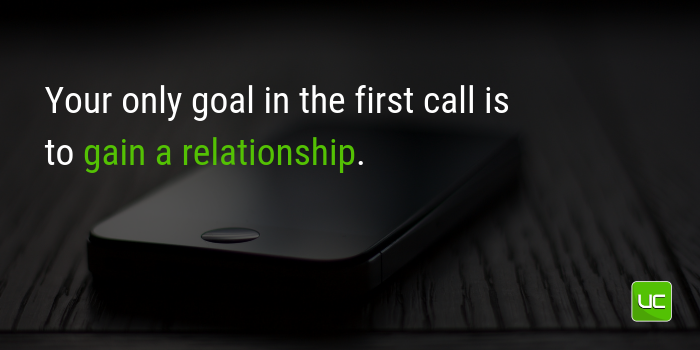 Some sales people won’t leave a voicemail in fear that the next time they make the call the lead will screen them. This may be the case in some instances, however in my opinion leaving a voicemail shows initiative and that I want more than just an opportunity to quote their job. Instead, I want to learn more about their company and what they do. This opens the dialogue about if we would be a good fit together. After leaving a voicemail, I always set up a follow up task to try again in the next few days. This is usually about 5 to 6 days later. I would say that almost 50-60% of the time on the next phone call, I still get sent to voicemail. But it also means that I will get 40-50% of people that answer. This percentage gets better with each subsequent phone call. So it may be the third, fourth, or fifth reach out before I finally get ahold of the lead. So if you fail once, you have to try again. And if you fail again, you have to try another time. 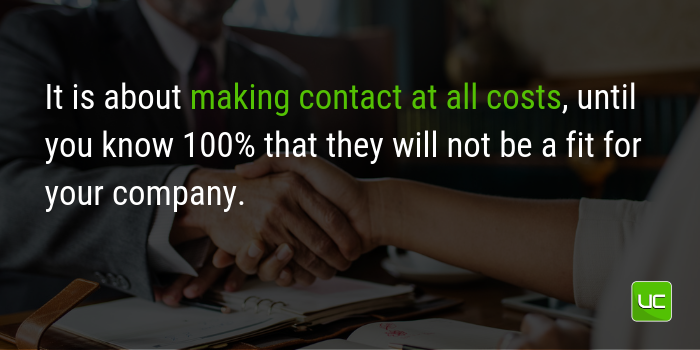 It is about making contact at all costs, until you know 100% that they will not be a fit for your company. If there’s still a chance, reach out and try to make contact. After I’ve made contact with a lead I can easily gauge by the conversation if they’re interested at all, or if they enjoyed the conversation. But the key thing to note is that in the first conversation I don’t ask for anything. I only try to learn about their company and what all they offer and do, from there i’ll let the conversation go in any direction. Connecting with the leads is probably the hardest part of the funnel process to stick with. Essentially, it amounts to a cold call. You don’t know the person, you don’t have any rapport, and it feels very intrusive. So take the intrusiveness out by not asking for anything except for the opportunity to communicate with them again. Make them the focus of the conversation: what is their company like, how did they start, what do you love about it, etc. Take notes about what they say so that next time you talk, you instantly have a rapport built with that lead. Later on you can start asking things like “have you ever thought about doing business this way, or using this type of product.” But do not let that first call be about sales pitch. Your only goal is to gain a relationship. Once you've gained the relationship, that person becomes an SQL. SQL stands for Sales Qualified Lead, which is a contact which has the ability to be sold to and is possibly interested in purchasing your product.On the other hand, a marketing qualified lead or MQL is a lead that is either accessing some of your marketing materials or checking out your content but hasn’t taken the next step in displaying interest. So we want to take those MQL’s and turn them into sales qualified leads. Let’s learn how to explore opportunities with cabinet SQLs. This phase of the selling funnel is when you want to turn the heat up a little bit and try to move them more toward the decision portion of the funnel. So they’re still in the consideration phase and you are helping them move to the decision. While we’re exploring the opportunities we are learning more about each other. Details about their company and how it interacts with our company are key here. But we’re still not asking too much out of them at this point. Basically, we are setting up a foundation to work from so that we can move them down the funnel which is more of the planning session. In our funnel, when someone becomes a sales contact lead, we try to make contact with them on at least a weekly basis. By contact I mean any of the following: email, sending a new resource, a phone call, etc. Whatever method you need to use to keep reminding them that you are interested in their business is what you should be doing. In my opinion most sales people neglect the follow up portion of selling. If they don’t receive the initial sale, they just begin to move on. But, I do realize that the SQL part is the hardest area of the funnel because you’re on the fence of a new customer going back up the funnel or further down the funnel. 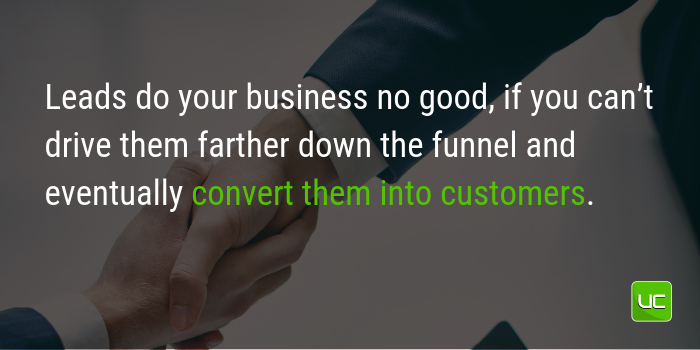 As a result we want to keep the pressure on to move them down the funnel toward a sale. The best way to create a routine is to follow a standard operating procedure. You should have a specific and well thought out way that you treat every SQL that comes in. This does not have to be a robotic method where you’re unable to be flexible, but you should have a checklist of what you want to obtain during the expiration phase. Basically, you want to obtain information about their company, you want to see what kinds of work they do (and you can even do a site visit as a point of contact for this), and you want to learn as much about the customer as you can. 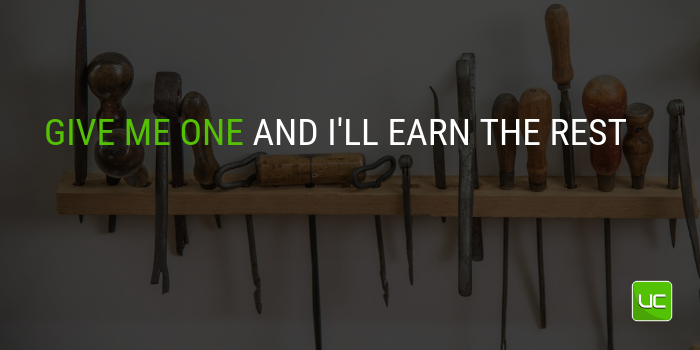 At the same time you want to start inputting what your strengths are as a company. So highlight how your strong suits would partner with your customer in whatever they’re undertaking currently. At first you were just asking for the opportunity to contact them again. But at this point you should continue the relationship by letting them know more about what your company does. 2. HOW CAN YOU PARTNER FOR GROWTH? This is a great way to get a lead in a different mindset. Instead of them thinking of you as being a ‘vendor’ or ‘salesman’ and themselves as a ‘customer’ you can be ‘partners in growth.’ This makes the conversation much easier to have because it becomes one between two friends and isn’t dominated by the normal salesman awkwardness. You want to build a foundation where both of you are partners and there is no hierarchy where one is ‘better’ than the other. 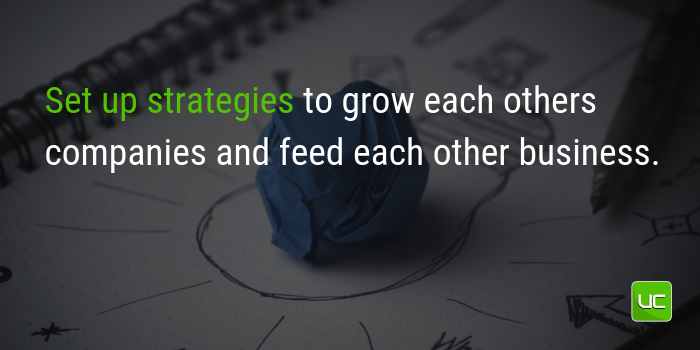 From there you can set up strategies to grow each others companies and feed each other business. In this phase we want to focus on sending decision based content, focusing on specifics about how you can partner. Start talking to them about lead times and payment terms, expectations after the sale as well as how you do your sales. Explain your process and turn around times so that they know all of these things during the conversation and it’s not something that you have to go over again later. Doing this will also let you know how serious they are about becoming a customer. Later, we will will move from exploration to planning, which is a small step but is a major part of closing the sale. Up until this point we’ve just been gaining efficacy with our clients and learning more about their business and how we can partner with each other. But now we’re actually planning on how our relationship can be successful and what we are going to do from here after we close the sale. That’s exactly what we’re going to talk about. I believe that this step, if executed properly and on a consistent basis, can increase your closing opportunity by at least 50% because that’s what happened to me. When I started making a sales funnel, or a sales process I never realized that selling and closing were two entirely different things. During the selling phase, the planning step is the last thing before moving into closing the job. So this is very important process and if executed correctly you will find that you won’t lose those customers who are on the bubble. In their eyes they already have such a time commitment into you and you have also invested the same amount of time into them that it makes sense for you to move to the next process. 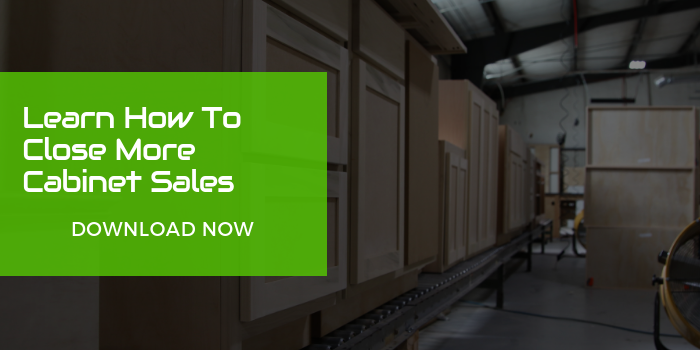 Let's lay the groundwork for planning with sales qualified cabinet leads so that you can convert them into a close-able sale. Remember that you are in the last step of the sales process, so you are as close to the decision phase as you’ve ever been. Start discussing long term goals: What do you do for your current customers that will benefit this new client the most? What is your shining light that your company does which is better than anyone else which can make your potential customer’s company even better? You must address their goals. During the expiration phase you have already learned about what they are looking for as their company grows, so take that information and use it! The lead should know that by doing business with you, they will end up a stronger company in the future. One thing that I like to address during this part of the funnel is how your customer could save more money, or make more money by doing business with you. Tell them how your efficiency or your facilities can bleed over to efficiencies in their facility or processes. How can they make more money? Ultimately every business has a bottom line, and the point of sales is to make money so it’s a great conversation to have about how your business can convert into cash for them. Another great question to ask yourself is: How can you make their life easier? Meaning, how much easier is it to do business with you, purchase products with you, or deal with you? In our cabinet component cutting business, we like to push the fact that we sell our products online for ease of access. Anyone can create bids so that they can be saved and later converted into a job making much less back and forth communication about what a customer wants in order to create a bid. Instead, they can simply create exactly what they need online and send it to us. All of this is to say that you should find what you do as a company which will make your customers life easier, and really highlight that point. This will be the best reason to do business with you! During this phase you need to be perpetually contacting the customer. It doesn’t have to be every single day, but you need to make sure that you have tasks set up and scheduled so that you are always in contact. Make time slots that are dedicated to that customer. This is such a vital time in the process that you must always be on top of things. You’re not being pushy at this point because you have developed a relationship with a customer that you know fits in with your business and you don’t want that opportunity to go to waste. Grant Cardone is one of the great salespeople out there, he has got a lot of content about how to sell more effectively. 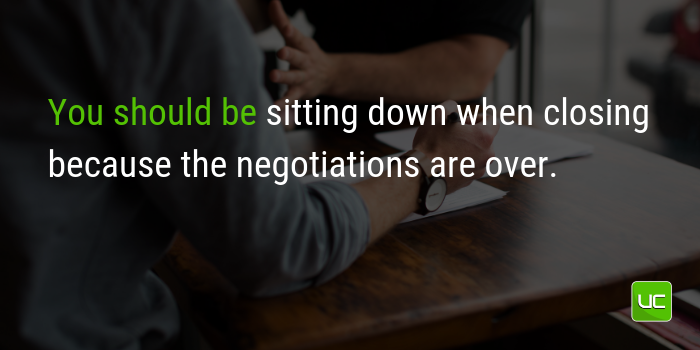 You should be sitting down when closing because the negotiations are over. If your customers ever stand up during the closing phase you should stay seated all the time. To stand during this phase is to signify that something has changed, and you don’t want to go backwards at this point. You’re so close to the bottom of the funnel and converting them into a sale so it’s time to sit down and close the deal. In the past we have talked about how to create inbound leads vs outbound leads. We’ve talked about why you need to create a sales process for your leads and have laid out the ways to plan for the future. By this time you’ve got consistent leads pouring into your funnel and you’re working on sales qualified leads as they move down toward the bottom and become a sale. So now we have to close that customer. This is the fun part of the job where all of the work pays off. This gives the customer a way out and gives you a way in without them feeling like they’re betting their whole business on your services. At this point in the funnel we need to stop selling so much, and sit down to login a customer. We are now transitioning from a focus on the things that we can offer, to focusing on negotiating the close of this deal. This means getting the terms of business down on paper so we can progress on starting the project. This is a way of drawing a line in the sand which signifies that you’re done selling and you’re going to be moving into the closing phase. It puts the onus on the business owner by asking if they’ve heard everything that they need to make a decision or do they need to stay in the funnel for a little while longer so that you can learn more about each other. This means we’re in closing time. When you’re in closing time you need to have all your docks, all your contracts, your quotes, drawings, and anything else which needs to be approved, finished and in the order that they will go in. These things should be stapled, in a binder, and done so that when you’re sitting at the table, the only thing that happens is you hand them the documents to be signed. Put some effort into having all your ducks in a row before you sit down at the closing table. Don’t delay. Don’t let a customer delay you as you’re moving into the closing stage. It doesn’t matter if they’re busy today or can’t make it to the office tomorrow. You should go to them and do whatever it takes to get your documents in front of them to close because this is a vital point in the process where you have got to convert them into a customer. At this point, you have spent too much time and too much effort to lose this customer because of something trivial like a scheduling conflict. If a customer starts to delay after they’ve moved into the closing phase and they start to backtrack, take just a couple short seconds and have a few points in your pocket ready to remind them why they got to the closing phase and want to business with you in the first place. In other words, there were some key points about what you do as a business which locked the customer in and made them want to do business with you. Going into your closing meeting, you have to know what those two points are so that you can rehash those and get them back into the closing mindset. One key thing to mention is that you can’t rely on yourself to remember these points in the heat of closing while you’re at the table because you may get thrown off guard by them trying to back out. So before you go, have them written out or memorized, and bring those two specific points to the table which make them really want to commit to business with you. After you reel the customer back in, continue right into the closing phase and finish the deal. Once you’re closed, you’re done selling. 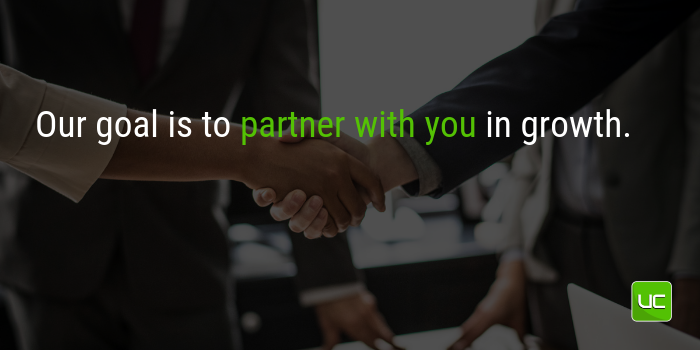 They are now your partner and you move into the ‘doing’ phase of the sales process which is delivering on everything that you promised and going above and beyond to make that customer yours for life and not just one job. Ultimate Cabinet Components is a frame-less cabinet component box manufacturer, with the goal of helping every customer gain 50% component capacity with no capital investment. By this we mean that outsourcing manufacturing allows a company to free themselves up to have more time to go sell. Time that would normally be spent on the shop floor or getting jobs ready to produce just is now freed up when you’re outsourcing your cabinet parts. With that capacity gain, an owner could focus more on sales. They could also consider hiring a salesperson who could put out a continuous sales effort with boots on the ground. Ultimately, it gives the owner more times to focus on a sales process. Which, as we’ve been talking about, sales is mostly a process. 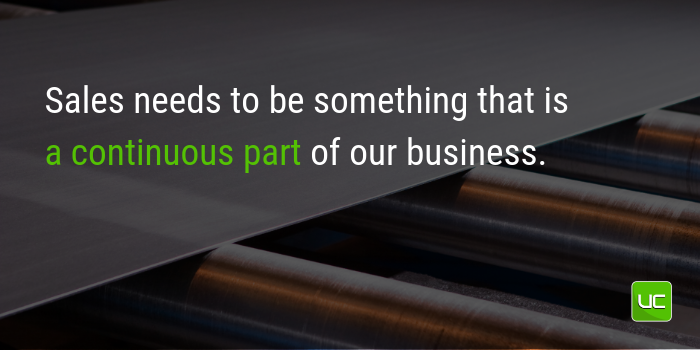 It needs to be something that is a continuous part of our business. So often sales are something that we do when we start slowing down or running out of work. Then we think that we need to put a huge emphasis on sales. For a business to be healthy and continually grow, we need to continually be focusing on selling. There should always be leads coming in the funnel at the top and customers coming out of the funnel at the bottom at a consistent rate. Another way that UCC helps customers sell more cabinet jobs is that we get you out of the vicious sales cycle. 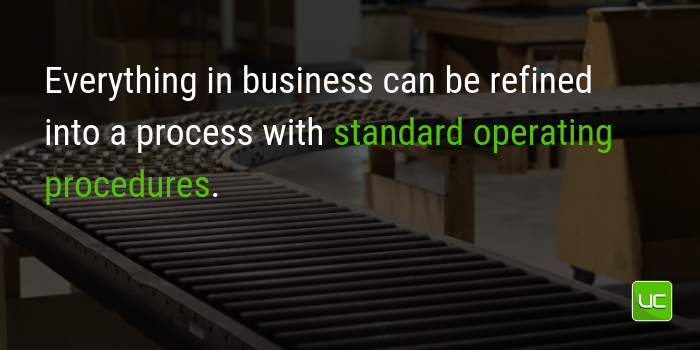 By outsourcing some or all of your manufacturing capacity, you are evening out that sales cycle to where you can have the opportunity to sell more. If you recall, the vicious sales cycle is something that a lot of small business’ follow. Which means they sell at a high pace then quit selling when they have enough work and production goes up and sales goes down. But then they run out of business and sales has to ramp back up and as a result the two lines are never consistently moving up and to the right. They get stuck in a wave pattern where either sales is high or production is high but they’re never both increasing. Instead we want those lines to be consistent with each other where production is following sales up and to the right constantly. In short, UCC provides the stability to a small business or any company to have a sales process and grow continually without having to be concerned with the issues of manufacturing or capacity. That way a company is able to focus on the leads that come in the door from their continuous sales effort. Need a Quick Way To Streamline Your Sales Process? Another way that UCC is going to assist companies in gaining more cabinet jobs is through our company’s goal. That goal is to partner with you in growth. This means that we will offer all of our resources in an effort to making you grow. Because when you experience growth, we also see that growth. We offer time, resources, and any other things we can to assist your future as a cabinet shop. Outsourcing has never been easier. These days with the existence of Allmoxy and Lockdowel assembly times being so easy and quick, the customer is at the forefront. All of these efficiencies being tied together means that the client can purchase, assemble, and build cabinets easier than ever. This creates more time for you to sell more cabinets than ever. I’ve shared my expertise in this area of sales and I hope that you’ve enjoyed it. If you want to partner in growth as a cabinet shop that wants to grow please let me know! We are always looking at ways to make thing more efficient and effective for our clients! To be successful, you have to have a laid out process for you cabinet company to make sales. I’ve written about the idea of a sales funnel which consistently brings you new leads in the top and pours out new customers from the bottom. What we’ve learned is that sales is a continuous process. It’s not simply something that we do sporadically when we think that we need work. Another idea that we have explored is how Ultimate Cabinet Components can provide manufacturing stability through increasing your capacity with no capital investment. These ideas end with a specific call to action. There is no reason in today’s day and age, with outsourcing being as easy as it is, that you shouldn’t be taking advantage. With a few clicks you can order cabinet boxes online, or find resources that make it more efficient and easy to do our jobs. There’s just no excuse to have a hold up on your cabinet sales. By following some of the simple steps of continuously interacting and communicating with your potential customers in order to close sales, you are going to set yourself apart from the rest of the competition. 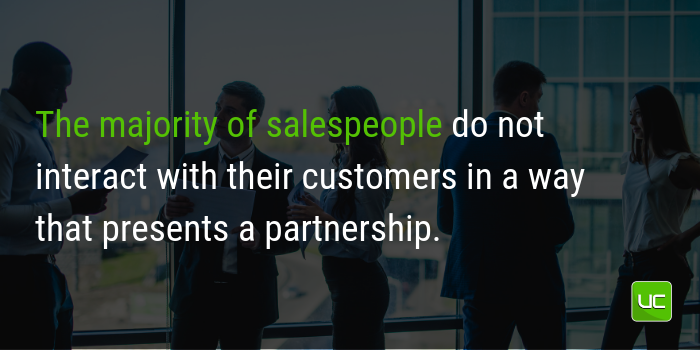 The majority of salespeople do not interact with their customers in a way that presents a partnership. There is never a win/win situation for the customer. Generally, it just involves a price and a schedule and that’s the end game. How many more sales would you be able to get if you could increase your capacity by 50% with no additional capital investment into your business? I bet the answer would be very staggering. For most cabinet shops, capacity is the thing blocking an increase in sales. However, if they were able to outsource some or most of their manufacturing production, then some if not all of their effort could be put into doubling their business through sales. Make Sure That You're Set Up for Selling Success! 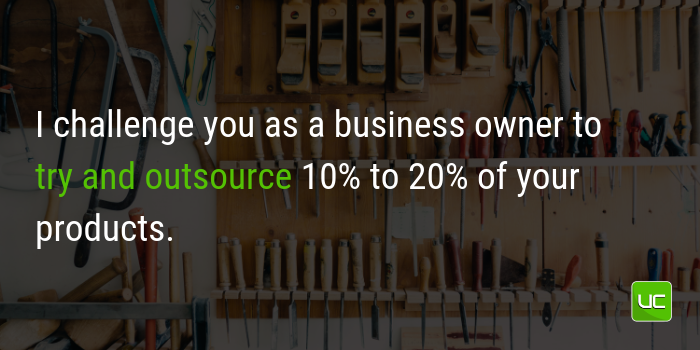 I challenge you as a business owner to try and outsource 10% to 20% of your products. Visually gauge how you would go through this process. How easy would it be to order, receive, and assemble the cabinets. See if this would be a fit for your company and put some numbers to this process. Would it work for more of your business? In other words, if you release some of the manufacturing strain and only had to receive the cabinet box components and assemble them on site, it should make your process much easier and at the end of the day it would reduce your risk and cost by a substantial amount. This would open up the doors for you to have time to sell more cabinets. Do you want to move past the step of visualization and actually experience this for yourself? Create an Allmoxy account and order a sample kit today so that you can see how easy it is to order and create your own kits.